The BEST snorkeling is not actually in Cancun, but 30 minutes south where the reef is closest to the shore at the little town of Puerto Morelos. Here the small boats get you right to the reef to see tropical fish and coral so alive and vibrant. The photo left is me snorkeling in Puerto Morelos on this tour. I have snorkeled in many place from Cancun to Isla Mujeres to Akumal and I have to say this was the best snorekl experience I have ever had. 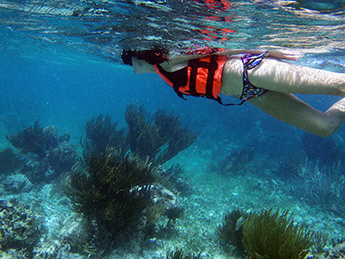 Read Trina's Trip Report about the Snorkel tour in Puerto Morelos.